With the all-new 2006 Lincoln Zephyr, Lincoln will introduce an entirely new generation of consumers to the qualities that have made Lincoln a classic American luxury marque for more than 70 years. Qualities such as bold and distinctive exterior design; an interior that is rich and inviting, featuring high-quality materials throughout; and a driving experience that can be both luxurious and spirited, according to the driver's desires. 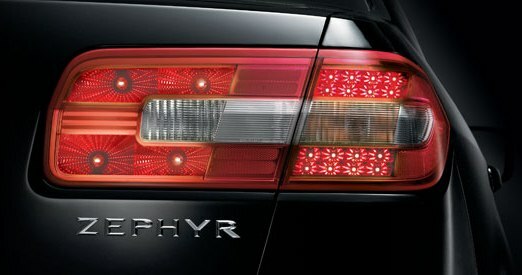 As a mid-size, five-passenger sedan, the Zephyr will offer younger buyers a luxury automobile with the comfort and refinement befitting a Lincoln. In this way, Zephyr will appeal to a completely new segment of buyers. This closely mirrors the mission of the original 1936 Lincoln Zephyr, which was introduced as the entry point for Lincoln luxury with a starting price of $1,400. The more things change, the more they stay the same. The exterior design of the Zephyr incorporates classic elements of Lincoln style – elements that have, over time, become essential to the visual heritage of the brand. The family resemblance starts at the front, with Lincoln's traditional waterfall grille. Situated between a set of jewel-like, quad projector-beam or optional HID headlamps, the treatment is recognizable as Lincoln. The Lincoln Zephyr's side profile features chrome trim at the beltline and on the mirror caps, set off by the wheels. The 17-inch alloy wheels are an important design element, available with a machined aluminum appearance or a chromed-aluminum finish. Low-profile tires reinforce the low, purposeful stance of the car. In the interior, real wood, high-quality leather, satin nickel and chrome trim highlight a cabin that continues Lincoln's reputation for interiors that deliver visual and tactile interest using genuine materials. White electro-luminescent lighting illuminates the round, chrome-ringed gauges, complementing the interior's white lighting, which uses white LEDs to backlight controls and switches at night. The instrument panel features a horizontal band of contrasting trim in one of three natural surfaces: Dark Charcoal with Ebony wood, Light Stone with Ebony wood or Sand with Figured Maple. "The Figured Maple gives the interior a fresh and exciting look," says Marek Reichman, director of interior design strategy. "The dark Ebony is classic and elegant for a more traditional sense of luxury. The aluminum, with its lightly raised ribbing, is very technical and modern. We were able to establish three completely different ambient settings through use of these materials." The 2006 Lincoln Zephyr is designed for comfort, too, with more than three feet of rear-passenger legroom. The spacious feel of the cabin was achieved by stretching the width of the base architecture by 30 millimeters and the wheelbase by 55 millimeters. The Lincoln Zephyr features a large 15.8-cubic foot trunk (Largest Trunk in its class) with a flat load floor and a low lift-over height. The decklid has compact hinge mechanisms that won't impinge on trunk volume or crush cargo. The rear seats feature class exclusive standard 60/40-split backs that individually fold flat with a convenient spring assist, giving access to the trunk and affording cavernous storage space. Thanks to a rigid and robust structure, the quiet interior is the perfect environment for the industry's first THX II-Certified® audio system. Optional on the Lincoln Zephyr, the system features surround-sound worthy of an upscale cinema. The system features fourteen speakers including 2 sub-woofers with 600 watts of power and a sophisticated processor that inputs bandwidth, peak audio levels and coverage uniformity to deliver a smooth spectral balance and wide dynamic range. To ensure that driver and passengers always travel well – and with the right directions – a new DVD-based navigation system is available. The system includes most of North America on a single disc and features a sharp, 6.5-inch-wide screen and text-to-speech technology for travel directions aloud in English, Spanish or French. The Duratec 30 V-6 is the heart of Lincoln Zephyr's powertrain. Using Intake Variable Cam Timing (I-VCT) to improve torque and reduce emissions, the engine generates 221 horsepower and 205 foot-pounds of torque. More importantly, it is the cleanest Duratec 30 ever, and will be rated for ULEV II tailpipe emissions in California, with a U.S. federal government rating of Tier II, Bin 5 tailpipe and LEV II evaporative emissions in states outside California. The engine is mated to a class exclusive six-speed automatic transaxle – gradually emerging as the new industry standard for luxury cars. The innovative, wide-ratio transmission plays a key role in Lincoln Zephyr's performance and smooth operation. The overall span of the ratios is approximately 6:1 versus 4.5:1 for a typical five-speed, which allows this smaller, more fuel-efficient engine to deliver efficient gas mileage along with a strong performance feel. Another bonus is that the modern six-speed automatic is lighter than some competitor's four- and five-speed transaxles, boosting performance and economy further. The Lincoln Zephyr also uses an electronic throttle control that works with the electronically controlled transaxle to ensure seamless shifts. Lincoln Zephyr's chassis is tuned for a quiet, comfortable ride with confident, responsive handling. All aspects of the fully independent suspension – dampers, spring rates and bushings – have been specially selected and tuned with an emphasis on ride comfort, without sacrificing precise and nimble response. The standard 17-inch tires, with their wide P225/50 profile, were selected to complement the suspension tuning, and for their quiet tread design. The rack-and-pinion steering system was tuned to be in harmony with the suspension and tires. Utilizing the car's stiff structure, the Lincoln Zephyr mounts the steering gear to the front perimeter subframe for reduced noise and vibration. Doing so enables the driver to better experience the car's relationship to the pavement via the steering wheel – no matter if it's a power-assisted parking maneuver or a high-speed lane change. Lincoln Zephyr incorporates a number of highly advanced safety technologies. It was designed with Ford's Personal Safety System™ and a body structure optimized to help manage energy in a crash. Lincoln Zephyr's Personal Safety System includes standard driver and front passenger air bags, seat-deployed side air bags for thorax protection, and three-point safety belts at all seating positions, with front-seat pretensioners and retractors. A full-length safety curtain provides head-protection coverage over the length of the window glass area – from A-pillar to C-pillar. The new air bags can prevent both front and rear occupants from hitting their heads on the side window or roof pillars in a severe side collision. In addition, the side-curtain air bag can help block glass splinters or other objects that could cause injury in a side impact. Lincoln Zephyr's new two-row air curtains also feature "roll-fold" technology – exclusive in the mid-size segment. If an occupant is resting his or her head against a window, the air bag is designed to slide between the glass and occupant as it fills. Typical side air curtains unfold like an accordion, using the occupant's head to keep the bag between the glass and the body. Lincoln's roll-fold keeps the air curtain against the glass, even when the occupant is out of position. Lincoln Zephyr features four-wheel disc brakes with a 4-sensor, 3-channel anti-lock braking system (ABS) and electronic brake force distribution (EBD). By measuring brake force and directing braking to the wheels that have the best grip, EBD helps achieve shorter stopping distances even before ABS activates. Traction assist is also standard. Lincoln Mercury's revitalization is built on strong products: 11 new vehicles, in six new segments, including five new Lincolns over four years. The Lincoln Zephyr follows the Mark LT truck and the concept version of the next-generation Aviator as the third new Lincoln unveiled thus far – all three in new segments for the brand. "This is a growth strategy for Lincoln, and we've proven that it works," says Hazel. "The Navigator was a huge hit for Lincoln, and the Lincoln Zephyr expands the brand into the fast-growing premium mid-size market." Lincoln Zephyr will be built at Ford Motor Company's Hermosillo Assembly Plant in Mexico. The all-new sedan goes on sale in the fall of 2005 in the United States, Canada and Mexico.